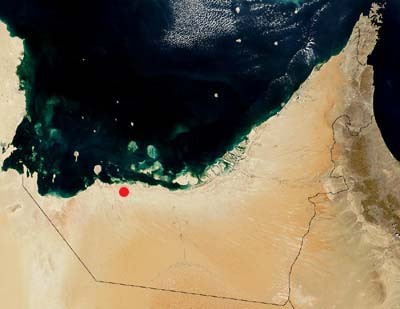 Two sites in the vicinity of Mleisa and a third in the adjacent area of Niqqa have recently been discovered by a team from the Abu Dhabi Islands Archaeological Survey. We were informed about the Mleisa sites by Mubarak Al Mansouri, Public Relations and Transport Co-ordinator for the Jebel Dhanna terminal of the Abu Dhabi Company for Onshore Oil Operations, ADCO. Mubarak informed us whilst work was underway by an ADIAS team on the Late Islamic sulphur mines at Jebel Dhanna, that he knew of a place in the desert where there were "dinosaur tracks". Subsequent investigation of the site revealed that there were in fact hundreds of footprints made by ancient elephants and other animals. Preliminary examination of the rock with the footprints suggests that it may similar in age to other rocks with the well-known Miocene fossils, known at other sites in the Western Region, such as Jebel Barakah, Jebel Dhanna, Ruwais and Shuweihat. Extensive collections of fossils have been made from a number of these sites, particularly of proboscidean (early elephant) bones. In November 2002 and in February 2003, an ADIAS team found two fossil elephant tusks, one 2.54 metres long and the other 1.9 metres long, at a site near Ruwais. 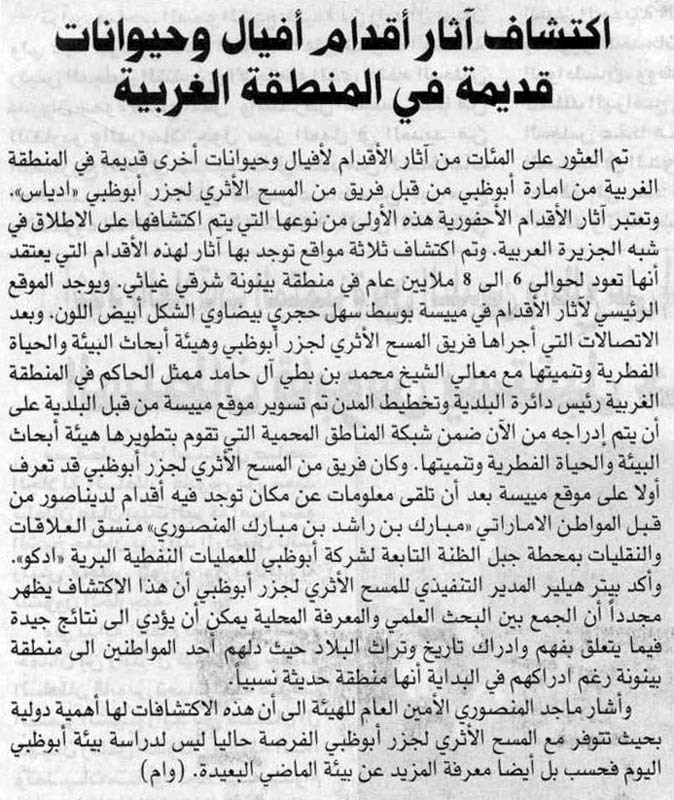 Following an approach by ADIAS and by the Environmental Research and Wildlife Development Agency, ERWDA, to H.E. Sheikh Mohammed bin Butti Al Hamed, Chairman of the Abu Dhabi Municipality and Town Planning Department and Ruler's Representative in Abu Dhabi's Western Region, the Mleisa site has now been specially fenced by the Municipality. It will now be included in the network of protected areas being developed by ERWDA. These sites are currently under investigation by ADIAS. Higgs, W., A. Gardner and M. Beech. 2005. 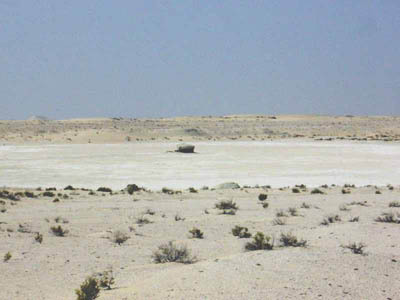 A Fossil Proboscidean Trackway at Mleisa, Western Region of Abu Dhabi, United Arab Emirates. In: P. Hellyer and M. Ziolkowski (eds. ), Emirates Heritage Vol. 1 - Proceedings of the 1st Annual Symposium on Recent Palaeontological and Archaeological Discoveries in the Emirates, Al Ain. Zayed Centre for Heritage and History, Al Ain. pp.21-27. ISBN 9948-06-130-6. [ to download this article in Acrobat .pdf format click here (1.2 MB) ] . Higgs, W., A. Kirkham, G. Evans and D. Hull. 2003. 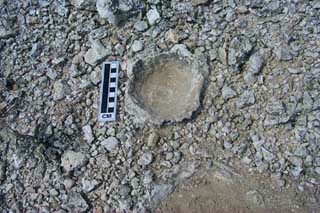 A Late Miocene Proboscidean Trackway from Mleisa, United Arab Emirates. Tribulus (Journal of the Emirates Natural History Group) 13.2: 3-8. [ to download this article in Acrobat .pdf format click here (691 Kb) ] . Construction of a new spillway resulted in a 10m water drop of the St. Mary Reservoir of Alberta,Canada. This exposed fine grained aeolian sediments and paleosols of late glacial or early Holocene age that have been subsequently subjected to severe wind erosion. This erosion has revealed both arich assortment of human artifacts, and the skeletal remains of many mammals, birds, and fish. Radiocarbon dated using Accelerator Mass Spectrometry (AMS) from the St. Mary site on selected remains, including Bootherium bombifrons (extinct muskoxen) with an AMS date of 10 980 ± 80 (TO-7691), Bison b. antiquus (extinct bison) with an AMS date of 11 130 ± 90 (TO-7693) and Equus conversidens with and AMS date of 11 330 ± 70 (TO-7696) indicates an age of 11 000 to 11 300 years before present for the St. Mary site. Furthermore, activity of the vertebrate fauna within the study area is shown by extensive trace fossils including many burrows and by the tracks of camelids (Camelops hesternus), equids (Equus conversidens), and bovids. A well preserved trackway allows the identification of the largest member of the St. Mary fauna.The trackway consists of a series of nine well preserved tracks, arranged in a symmetrical, staggered, even spaced pattern, stretching over 11m. The tracks are circular to slightly ellipsoidal in shape with a diameter 55 to 70cm. They consist of concentric rings of sediment pushed up while the animal walked on soft muddy ground. The innermost ring of St. Mary tracks represents the true foot impression and has a diameter of 45cm, suggesting a mature female or immature male. The average stride length of 2.4m is consistent for a modern elephant with a shoulder height of approximately 2.5m walking at slow speed, which would be expected in the soft conditions that existed at the time. The large size of the tracks, their circular to ellipsoid shape, and the estimated shoulder height, indicate that only a proboscidean would have been capable of their production. Mammuthus primigenius is assigned as the probable maker, being the most common Proboscidean in Southern Alberta, though M. columbi may have been present. 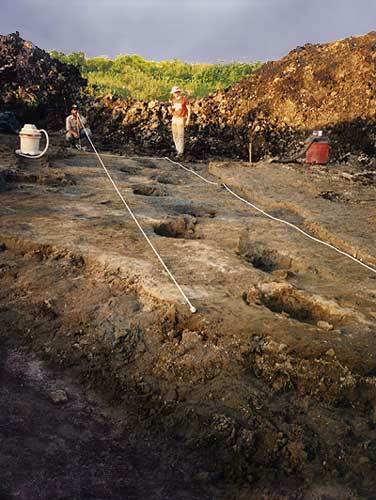 Figure showing mammoth trackway found by Ed Boyce, Shayne Tolman, and Barry Wood. Hills, L.V., P.E. McNeil, and S. Tolman 1999. First reported Canadian proboscidean trackway from the St. Mary Reservoir, Alberta, Canada. Journal of Vertebrate Paleontology 19, suppl. to (3): 51A. McNeil, P.E., and Hills, L.V. (mcneil@geo.ucalgary.ca, Dept. Geol. & Geoph., Univ. Calgary); Kooyman, B. (Dept. Arch., Univ. Calgary); and Tolman, S., (Dept. Res. & Env., Univ. Calgary, 2500 University Drive NW, Calgary, AB, T2N 1N4). 2000. First reported Canadian Proboscidean trackway from the St. Mary Reservoir, Alberta, Canada. Mastodon trackway - about the set of preserved mastodon footprints found at the Brennan site near Saline, Michigan. There is a cast of the trackway on the third floor of the University of Michigan Exhibit Museum of Natural History. Read also about how the cast of the mastodon tracks was made for the museum. See also a Plan of the tracks and a photograph of the site. Excavation of skeletal remains of a late Pleistocene Mammut americanum (American mastodon), preserved in pond sediments in southeastern Michigan, led to discovery of a trackway of another proboscidean..... Most depressions are compound prints, recording the outline of a relatively round forefoot, over which is superimposed the more oval hindfoot. Comparison with trackways of extant elephants suggests the gait was a slow walk, and from the size of the prints (forefoot diameter ca. 50 cm; hindfoot ca. 45 x 60 cm), the animal must have been a mature male. The regional abundance of mastodons relative to mammoths and the relation between stride length (ca. 2.5 m) and foot size suggest that the animal was a mastodon. Morgan, G. S., Lucas, S.G., Hawley, J.W., Love, D.W., and Myers, R.G. 2002. Mammal footprints from Pleistocene Lake Otero, Tularosa Basin, White Sands Missile Range, Dona Ana County, New Mexico. New Mexico Geology, v. 24, p. 67. The Cenozoic strata of New Mexico contain a sparse record of fossil mammal footprints, including sites of Eocene, Oligocene, Miocene, and Pliocene age. We report the first Pleistocene record of mammal footprints, from the Tularosa Basin on the White Sands Missile Range in Doña Ana County, southern New Mexico. The footprint site is at an elevation of about 1,195 m on Alkali Flat (NM Museum of Natural History site L-4979), along the western shore of Pleistocene Lake Otero. The footprints were discovered in 1932 by a government trapper named Ellis Wright. 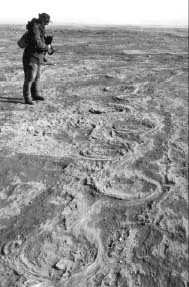 Love, Hawley, and Donald Wolberg examined the footprints in 1981 and identified them as belonging to elephant (mammoth) and artiodactyl (camel). Lucas, Morgan, Myers, and Pete Reser visited the tracksite in 2001 and collected metric data on representative footprints. sediments of the Otero Formation exposed over an area of about 75,000 m2. The 25 preserved mammoth tracks are very large (maximum diameter 430-620 mm), round to ovoid in shape, and closely resemble published tracks identified as proboscidean. Two preserved mammoth trackways, one of six tracks and one of four tracks, indicate a 2-3 m stride length. A smaller heart-shaped track with two distinct digits and a pointed anterior end, photographed in 1981 is characteristically camelid. 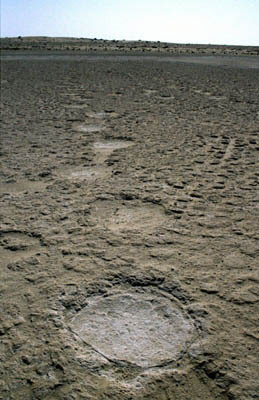 Although no such clearly preserved tracks remain at the site, a trackway of six footprints shows the pacing gait characteristic of camelids. These tracks have diameters of 160-180 mm and a stride length of about 1.3 m, dimensions compatible with a large camel. Teeth and postcranial bones found near the tracksite suggest the trackmakers were probably the Columbian mammoth (Mammuthus columbi) and a large extinct, llama-like camel (Camelops hesternus). Oriented trackways indicate these large ungulates walked to and from the waters of Lake Otero, probably to drink. Visit this above website for information about the Verde formation mastodon and camel trackways near Camp Verde. This is an article prepared for Fossil Adventures, a column written for the Southwest Paleontological Society newsletter, a subgroup of the Mesa Southwest Museum in Mesa, Arizona back in the mid 90's. LÓPEZ, G., MAYORAL, E., MUÑOZ, A., PÉREZ, A. & SANTAMARÍA, R. (1992). Nuevas icnitas de mamíferos carnívoros en el Mioceno inferior del sector occidental de la depresión del Ebro (Logroño, La Rioja). [New Lower Miocene footprint of the Carnivorous Mammals in the Western Sector of the Ebro Basin (Logroño, La Rioja)]. Rev. Soc. Geol. España. Vol.5; 39-53. Tom Williamson and Gary are documenting a Miocene trackway that includes tracks of camels and a large carnivore from the Santa Fe Group near Rio Rancho, New Mexico (Society for Vertebrate Palaeontology News Bulletin, no.163). An Overview of Dinosaur Tracking (also mirrored here) (1994) by Glen J. Kuban. Originally published in: M.A.P.S. Digest, Mid-America Paleontology Society, Rock Island, IL. Dinosaur trackways - Brooklyn College, City University of New York. Glen Rose Trackway - a series of fossilized dinosaur footprints left some 107 million years ago at the edge of a lagoon. Excavated from the bed of the Paluxy River, near the town of Glen Rose in central Texas. Jobaria and the elephant - (also as pdf file version - 604 Kb) - about some experiments made with a modern African elephant called Angus to help understand the anatomy of a sauropod. While working with Angus, Dr. Sereno and Jeff Ogradnik noticed that the sole of the forefoot was much larger than the sole of the hind foot. The difference was nearly 1.5 times - the same difference they measured for the weight of the limb supported. To see a picture of the difference in size between the prints click here. Trackway site shows dinosaurs on the go - the first recognised evidence of urination in dinosaurs!